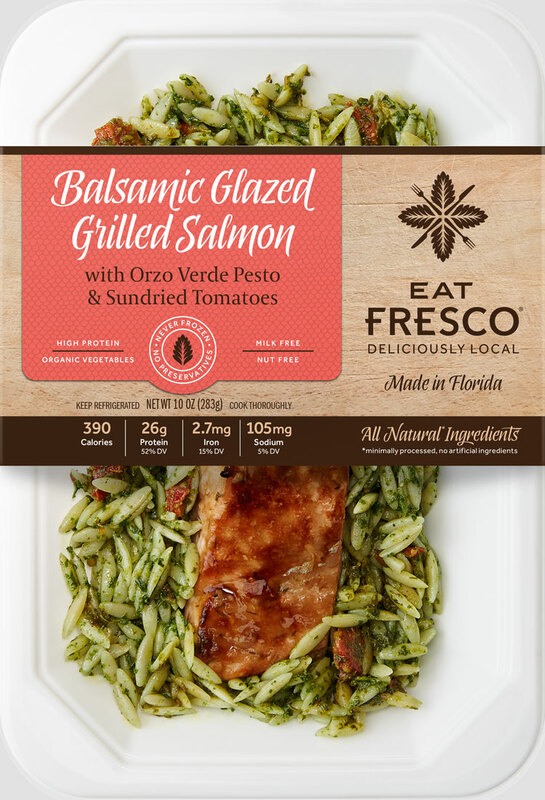 Fresh, pure Antarctic Salmon, marinated then glazed with balsamic and dill over orzo pasta and sundried tomatoes tossed in a spinach and basil pesto sauce (nut-free). Fresh, never frozen, Antarctica Salmon, environmentally conscious, sustainably farmed, never treated with antibiotics or antifouling chemicals, no added hormones, sourced responsibly from Aquaculture Stewardship Council (ASC) certified facility. 2. Microwave for 1:30 to 2:00 minutes or until cooked through, microwave times vary. Instructions based on a 1200 watt microwave. 3. Carefully remove tray from microwave by its corners and let sit momentarily before opening. Package may produce HOT steam after eating. 1. Preheat oven to 350º F degrees. 2. Remove label and film from tray, remove and place food into oven safe container. Do not place package in oven. Cooked Orzo Verde Pasta [Orzo white pasta (durum semolina), organic fresh spinach, olive oil, roasted garlic cloves, organic fresh basil, sundried tomatoes, kosher salt], Grilled Salmon Filet [fresh salmon, olive oil, balsamic vinegar (concentrated balsamic vinegar, pure cane sugar) honey, garlic cloves, spices].